Whether its faith, service, or fun, communities across the nation are witnessing the contributions of local AHG Troops. 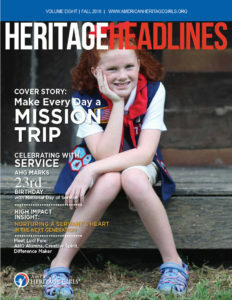 Heritage Headlines, AHG’s quarterly magazine, seeks to spread those good news stories while encouraging other Troops to follow in their footsteps. American Heritage Girls is committed to reaching the next generation. Learn more about how AHG stewards your generous gifts to build women of integrity in our Annual Ministry Report. 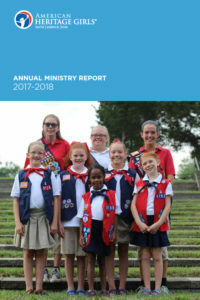 Read our 2017-2018 Annual Ministry Report here.